TURMERIC is a highly valued and powerful medicinal herb. Owing to CURCUMIN, the active medicinal constituent of Turmeric, it has been used for thousands of years for its remarkable health-promoting benefits. Unfortunately food-grade turmeric is very poorly absorbed, and only 3% of it contains CURCUMIN. One has to take an extremely large amount of turmeric powder to be of systemic benefit. Untamed Animal Health therefore uses 95% Turmeric extract, which provides pure Curcumin, to significantly enhance your pet’s overall health and well-being. The turmeric extract that we use is systemically well absorbed, and is 32 times more powerful than a high quality turmeric powder! HOW DOES CURCUMIN HELP YOUR PETS? 🐾 ANTI-ALLERGIC: Curcumin balances the immune system, and alleviates symptoms associated with allergies by decreasing inflammation and histamine release. These properties give Curcumin great potential for clinical management of allergic reactions like asthma, food allergies and allergy related skin conditions. antimicrobial protection against bacteria like Staphylococcus epidermis, Staphylococcus aureus, Klebsiela pneumoniae, Helicobacter pylori, Escherichia coli, Salmonella and many others; viruses like influenza viruses, herpes, coxsackie, hepatitis viruses, papilloma viruses, encephalitis viruses and many more; fungi like Cryptococcus neoformans, Candida albicans, and other skin fungi like T.rubrum, T. mentagrophytes, E. floccosum and M. gypseum, and parasites Schistosomas, Toxocara canis, Eimeria species, Plasmodium, Trypanosoma, Giardia lamblia, Leishmania and Cryptosporidium. 🐾 POWERFUL AGAINST INFLAMMATION: Curcumin reduces inflammation by multiple mechanisms like inhibiting pro-inflammatory cell signaling, inhibiting immune cell migration to the active sites of inflammation, and reducing excessive existing inflammation by decreasing the activity of inflammatory enzymes. 🐾 PROTECTS THE NERVOUS SYSTEM: Curcumin protects your pet’s nervous system against inflammatory damage and degeneration caused by multiple pathological agents including toxins, stress related high cortisol levels, and age related degenerative conditions like Alzheimer’s and Parkinson’s disease. 🐾 PROTECTS AGAINST HEART DISEASE: Curcumin provides protection against cardiac hypertrophy, inflammation, plague formation in the blood vessels, blood clot formation and high cholesterol. 🐾 ANTIDIABETIC: Curcumin illustrates promising protection against insulin resistance, diabetes and its associated inflammatory pathways. 🐾 ARTHRITIS PROTECTION & RELIEF: Curcumin is well researched for its powerful anti-inflammatory actions which, in addition to its protective properties on cartilage, adds exceptional medical value to this plant extract for the treatment of arthritic joint diseases. Research shows that a highly concentrated Curcumin extract stimulates the production of glycosaminoglycans and chondrocytes, which are involved in the formation and structural integrity of cartilage. Curcumin supplementation can reduce joint pain, enhance articular function, and improve quality of movement. 🐾 CANCER PROTECTION: Research illustrates that high doses of concentrated Curcumin extract can inhibit the growth of various cancers, and enhance the anticancer effects of chemotherapy drugs and radiation. Curcumin, may alleviate the risk of cancer by supporting the natural defense mechanisms of your pet by increasing antioxidant protection, inhibiting inflammatory degeneration, and enhancing liver detoxification of cancer-causing agents like cigarette smoke, and chemicals found in foods-, insecticides-, shampoos-, pesticides and herbicides. Curcumin inhibits cancer cell development and spreading. 🐾 HEALTHY DIGESTION: Curcumin provides significant anti-inflammatory protection in your pet’s digestive tract, alleviating inflammatory damage, abdominal pain and gastric discomfort associated with IBS (irritable bowel syndrome), ulcerative colitis, Crohn’s disease and ulcers. 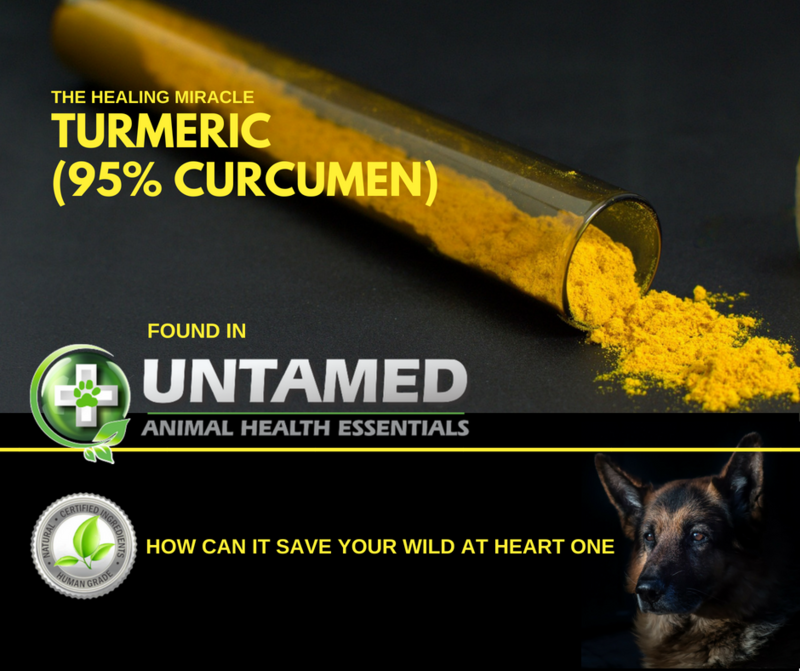 The following Untamed Animal Health products are formulated with abundant quantities of Curcumin to ensure that we provide your Wild at Heart Ones with only the highest quality health care. This entry was posted in SKIN, UNDERSTANDING NATURAL REMEDIES. Bookmark the permalink.